A treat, a photo by megan_n_smith_99 on Flickr. Yesterday was a bit rocky, and this morning all sorts of random things were getting spilled or lost or dropped.. I did some chores and painted some, then went out to get the last few frames for the Artwork I'll be hanging at Miro next week. I needed a treat to get over the rocky bits so I got this book I've been eyeing for a month and a pumpkin spice latte. The book is, in fact, mostly empty. 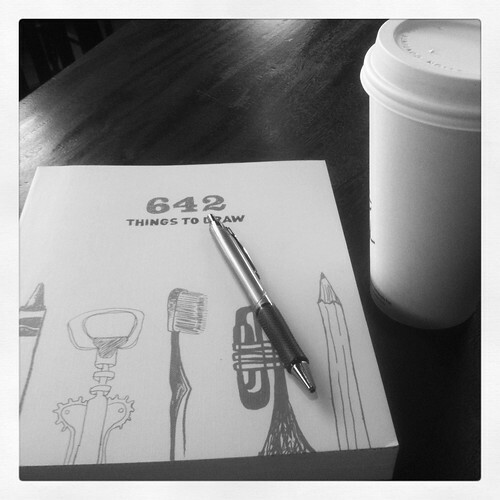 It's basically a book of drawing prompts with space to draw. I wanted to get some new ideas of things to draw and try to loosen up a little and sketch, since most of my drawings are pretty controlled. Now I am home for an evening with tea, the BBC's Merlin, and some lace knitting. I am knitting lace with super bulky yarn and it's the fasted lace I've ever knit. Falling, a photo by megan_n_smith_99 on Flickr. Now that I've started thinking about the farm - and more particularly writing about the farm - I've remembered more. Sometimes when you write things down your mind moves so fast --and your fingers fly to catch up --and your fingers end up typing things before your "rational" mind points out to you that you don't remember those things. And then you discovered you do remember. Your senses remember. I mentioned we had 4 ewes to start with but I could not remember the name of the 4th. Well, it's come to me. Her name was Phyllis, after Phyllis Diller. She had flyaway grey hair and a wild look in her eye. One of those 4 ewes was the mother of the 1st lamb born on our farm. The first lamb was born under a pine tree, during a snow flurry, and her name was Shadow, as she was almost mistaken for one. I believe the 2nd lamb was Dilly. And Dilly was probably Phyllis' offspring -- that would make sense-- But she was also named after an advertising slogan that Dairy Queen was using at the time - “scrumpdillyicious”. Dairy Queen was the only fast food place that was on Vashon Island during the years that I lived there. It's funny - I would never remember that slogan if we had not named a sheep after it. I think another of our 1st year lambs was called Dierdre. She was Gabby's daughter. Gabby was our white ewe, and all of our best sheep were her descendants, though only a few of them were white. When lambs are first born their mother gently licks away the afterbirth and bits of grass and hay that have gotten to stuck to it. The mother nudges the lamb to stand up, which it eventually does on thin shaky legs. If the lamb has been born in the field we would take the lamb and the mother into a pen in the barn. If you picked up the lamb and carried it to the barn the mother would follow worriedly after, and her reaction towards you would depend on her temperament. Some ewes can be quite nasty if you pick up their child. After a few days in the little warm pen with its mother the lamb would be ready to join the others during the day, in the pasture. While the mother grazed the lamb would follow her about, occasionally bleating in a thin plaintiff voice, and if there were other lambs they would play together, having little races and running around as fast as their wobbly legs could carry them. Lambs fall down a lot, and have little dirty knees, which is most obvious on the white ones. (Most of our lambs were black or brown at birth.) The young lambs have tiny short pin curls, and their skin feels slightly too big for their tiny bodies. If their mothers are used to humans then the lambs won't mind being handled a bit, but they really do not like to be away from their mothers for long -- and their mothers certainly like being separated even less! During lambing time there was always a little bowl of water on our kitchen counter holding what looked like green rubber Cheerios. They were actually little rubber bands -- and I am sorry if this sounds awful -- it seemed normal to a child growing up on a farm -- the water softened the rubber bands, which would be stretched out on a little metal device and put at the base of a newborn lamb's tail. After a few days the tail would fall off. Someone, an adult I suppose, would hang the tails along a fence. (That seems quite gruesome to me now.) I don't think this process hurt the lambs much, and it was done to help keep the wool clean and prevent infections because frankly sheep don't have very good hygiene. I am not really sure sheep have ANY hygiene to tell you the truth. Though being vegetarians their filth is really not as filthy as it could be. Perhaps sheep just do the best that they can, given that their brains are approximately the size (and one assumes the texture) of a soft boiled egg. Also the lack of opposable thumbs, or digits of any kind, probably also cause difficulties. One of the denizens of our farm was Brandy, an Australian Shephard. Australian Shepards were actually bred in the US, not Australia. They were used to herd Australian sheep, though. Our sheep were mostly Romney and Dorsets, which are British breeds. This photo actually includes 2 guest sheep - I think. The two on the left I think were visiting for the purpose of being bred with our ram. We mostly raised colored sheep and had many shades of grey and brown. I think the sheep on the far right of this photo is Cinnamon, a bossy and fierce ewe with greyish brown wool and warm brown hair on her head, like fringe. She had steely grey eyes and was not afraid to stare down the enemy and stomp her foot. The enemy would be any person not carrying food, and strange dogs. Brandy was welcome. But the thing about sheepdogs is that while they are born with a herding instinct, they are not born knowing what to do with it. I believe also they are generally very docile and companionable, having been bred to care for other creatures, and as such you could leave them alone with your free range chickens and not need to count the chickens when you came back. 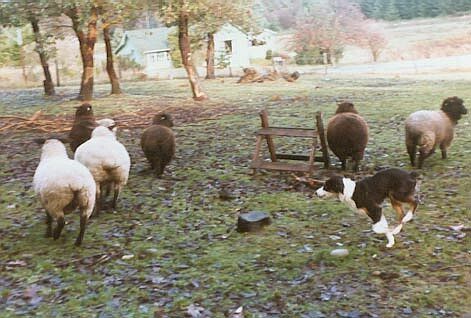 Brandy practiced his herding on both sheep and chickens but only did the right thing occasionally by accident. Brandy never did, for whatever reason, go and get his herding training from older sheep, which is the thing one does. I am not sure why since his parents lived on the island. One of them, the mother I guess, herded Jacob sheep. I desperately wanted to get some Jacobs because they are spotted. However they also have horns, sometimes multiple sets, which I suppose increases your odds of accidentally being gored to death but an irritable flock. For some reason, throughout my childhood, there was a poster of sheep on the bathroom wall. So instead of reading the newspaper or Garfield comics when in the bathroom (Garfield was still funny back then), I studied breeds and make shopping lists for future additions to the herds. Not that my expertise was ever consulted. I'll share one other bit of sheep lore. I think this was one of those things you are supposed to do but I don't know how you know you are supposed to do it. We did have a couple of sheep books on the shelves in the living room so it may have been from those books. * You're supposed to have one sheep who is the boss sheep, and she wears a bell, and all the other sheep follow her around. When its feeding time the boss sheep runs towards the barns and all the other sheep trail after. I think you are supposed to pick a strong and independent sheep to be the boss. Our first boss was Gabby, who was not really all that independent, but she was very friendly and seemed to like people (especially people holding grain, hay, grass, or apples) and she wore an old cowbell that made a hollow clank-clank. Later after Gabby died Cinnamon, the mean-eyed old Doe took over. 1015leaves1, a photo by megan_n_smith_99 on Flickr. "No spring nor summer beauty hath such grace, as I have seen in one autumnal face." One of my Autumn memories on the farm is of going down the "rocky road" at the end of our street to pick apples. There was an overgrown dirt road leading down into a large and wildly overgrown lot, and in amongst the blackberries and evergreens there were some old and forgotten apple trees. I don't know if there was ever a house back there - if there was we never found the foundation - but there had been an orchard and to the orchard we went to gather apples. The Brits sensibly have a word specifically for stealing apples - alas, there seems to be no American equivalent. "...the earliest example is from 1866. The source is uncertain but seems to be from a dialect term meaning something withered, shrivelled or dried up. It may be linked to the old adjective scrimp, scanty or meagre, from which we get the verb scrimp, to economise or be thrifty. Support for this comes from an early meaning of scrumping, which referred to taking windfalls or the small apples left on the trees after harvest. This evolved into illicitly taking any sort of apples." I, myself, find Scrumpy to be just a bit too much for my delicate palate. But --Back to my erstwhile adventures in scrumping. Apples were to be had. There was no one else about to pick them. The land was owned by a developer who perhaps had never even set foot on it - if he had, he certainly did not make a habit of it. In the late 1970s we were going back to the land and I guess it was okay if the land was not ours, providing no one else was using it. Nature's bounty should not go to waste. I can remember my sister and I using some of these apples to carve apple heads for dolls. We dried them on the wood stove. I cannot recall that we ever came up with an idea to make bodies that met our exacting standards. We also carved apples like tiny jack-o-lanterns. I can't at all recall how we hollowed them out, but I do remember that it was extremely tricky. And we peeled them, in long swooping peels. If you threw a peel over your shoulder it was supposed to land in the shape of your true love's first initial. Usually a C. And it was always exciting to see if you could peel an entire apple in one fell swoop - one long spiral. This all happened decades ago, and those apple trees are long gone. The abandoned orchard no longer exists, the land was cleared, and it's now the site of a Johovah's Witness church. But I'd like to think that God was just as present in those apples. We Ran Away to an Island. And then I digressed a bit into livestock and stadiums. 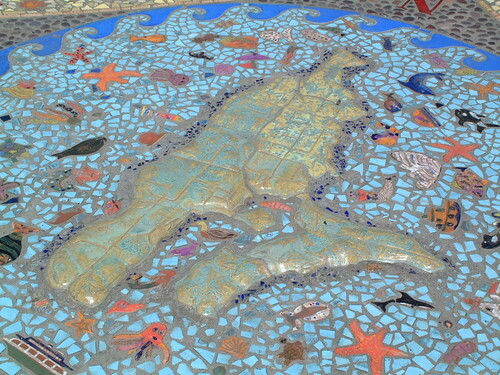 Map of Vashon Island - detail from a mosaic sundial at Vashon's Ober Park. Does anyone know who the artists is? mosaic Sundial, a photo by megan_n_smith_99 on Flickr. We were the third owners of the farm. I am not sure if the first owners had any livestock - though they did have a very good landscape designer and there was something in bloom year round. The second owner had horses. Or maybe it was just 1 horse. As I recall the fences were not in great condition and they were not suitable for smaller animals like sheep. Sheep, although they are about a stupid as God made any creature, do have some sort of instinct to escape. Perhaps it is a dim memory of the days before they were domesticated. And sheep, of all animals, are surely very domesticated. The will and ingenuity has been generally bred out of them, but the occasional escape artist will come along from time to time. As I recall our most gifted escape artist was a young ram named Abbie. He was born on Abe Lincoln's birthday. The newborn lambs also regularly hopped though the fence and grazed along the side of the road. There were many times when people stopped by the house to tell us that the lambs were out. They were, and there was nothing to be done about it but to wait for them to have their snack, hop back in, and grow big too big to fit through the fence. And then start all over the next year. Fortunately the grass by the roadside was lush and succulent and I don't think they generally went into the road when tempted by such bounty. At any rate, the fences had to be redone before we could acquire any animals. I am not sure how long that took, but I do remember the excitement of bringing home and name our first little flock - Bert the ram, later named Bert Roland after a family friend, Snuffy, who looked like the Snuffleupagus with shaggy brown wool, Gabby, a pretty white sheep who had a lot to bleat about, and I think there was one more but I can't recall its name. Please note Burt was also named after a Sesame Street character. We were 7 or 8 then, we had our inspirations. Most of the flock we eventually owned were descended from those original few. I can only recall purchasing 3 more additions to the flock later - Cinnamon, so named for her beautifully colored wool, Bonnie, and Jedediah Smith, our second ram. Bert's brain had sort of gone off by then and he had become unpredictable and quite unpleasant to be around, so we upgraded to the newest model. Jed was quite young when we got him an rode home from auction in the cab of the truck with the rest of the family. I do not think the smell of sheep ever really left that hulking green bohemuth. Jed's father was an absolutely enormous ram called The Quad, as he was a quadruplet. And I think Jed was a twin or triplet? We never had more then twins on our farm. I seem to recall that sheep auction as having been in the Kingdom? Could that even be possible? The Kingdom was Seattle's beloved and iconic stadium, so I am probably remembering that wrong. It graced downtown Seattle from 1976 until 2000. It was demolished in 2000, but the original construction and repair costs won't be paid off until 2016. There is something wrong here. Also, the 2 stadiums that replaced it, while all high-tech and stuff, are kind of ugly in my opinion. Though city planners seldom do ask my opinion. The destruction of the Kingdome was recognized by Guinness World Records for the largest building, by volume, ever demolished by implosion. You could feel the WHUMP all around town. Apparently in the aftermath terrified rodents fled the wreckage and moved into local businesses - many of which had sub-basements that are now part of the Seattle Underground - surely an ideal nesting ground for rodents. 1) Uther appears to have always raised Arthur, leaving out Sir Kay and the sword in the stone. 2) Merlin is about the same age as Arthur, or probably a bit younger, which would appear to make it impossible that he was involved in Arthur's conception, which traditionally Merlin was. 3) They've left out the bit where Merlin met Uther when he correctly diagnosed the reason his castle walls kept falling down - 2 dragons fighting under the foundations. In this version Merlin never was Uther's court magician and magic is outlawed. 4) Morgana seems to be Arthur's foster sister, not his half-sister. 5) Guinevere, whose name means something like "White enchantress"* and is always described as fair is actually dark in this version. And that bugs me just because of the name. Also in this version she's a servant. 6) Arthur is a big jerk. *depending on who you ask. miss out on all the sword and the stone stuff. Maybe they'll work it in later somehow, but it is supposed to be what identifies Arthur as Uther's son, which has already happened in this version. Alas. And I can't help really wishing they'd gone with T.H. White's interpretation and included a talking hedgehog. There are not many shows that could not be improved by the addition of a talking hedgehog. I'm not even half way though the 4th episode so I may rant about this some more another day. Harvest Soup, a photo by megan_n_smith_99 on Flickr. Autumn is in the air. It's been pretty nice here - some people think too nice - but I am enjoying it. Still, the nights are getting cooler, the air feels thinner, and Starbuck's has rolled out the pumpkin spice lattes. I made apple crisp yesterday and the house still smells good. I have not made soup yet this year but I am sure I will soon. Or maybe I will make chili. My famous almost-no-spice chili. I got some pumpkin at the store today and we'll see what i do with it - there are really so many options! And there is a Western Scrub Jay who has been singing outside my window every afternoon this week. No one is answering him, either. A little research indicates they are not supposed to live this far North, but either that's wrong or this guy is lost. I hope he makes his way south soon. Pretty soon the crows will dominated the urban landscape, with the odd seagull or heron near the water. We have a winner from my most recent give away. Random.org has selected a winner! Heather Barradas, can you send me your mailing address? There is an email link at the bottom of the page on my website! Becoming, a photo by megan_n_smith_99 on Flickr. When I was a kid, I recall spending a fair bit of time drawing floor plans for my imagined dream house. I can't remember all of the specifics, but I am sure my dream house contained lots of playrooms, bookshelves, probably secret rooms behind bookshelves, spiral staircases, and large playrooms. I actually wish I still had some of those drawings, because I'd like to see what my younger self held as an ideal. My adult self generally likes living in a small place - less to clean - though I'd be quite happy to have another closet or 3, and there are times when I think a bedroom with a door would be nice. (My condo is a studio.) I am not sure how much my younger self would care about the view. I grew up on Vashon Island with an amazing view of Mount Rainier and the Cascades. I think I took it for granted, though. Now I really do appreciate my view of the Olympic Mountains. I also doubt my childhood self would even care about my favorite things about my kitchen: the in-door water and ice dispenser in my fridge, the garbage disposal, the dishwasher, a perfect cupboard for tea, and the built-in microwave which I rarely use except for softening ice cream and melting butter. My childhood self might find the TV in the bathroom appealing. However my adult self views it as unnecessary. It came with the place. I rarely use it. Occasionally I check the weather while brushing my teeth and I did watch a documentary about B2 bombers while painting my bathroom. the 5 jillion cable jacks might appeal to my younger self, once she figured out what cable and a cable modem was. terrarium, a photo by megan_n_smith_99 on Flickr. When I was growing up on a farm on Vashon Island, I belonged to 4-H. For a little while we* belonged to a group that focused on fauna, but then we switched to a group that focused on flora. We had our own garden, in which as I recall we grew radishes. We must have grown other things as well but radishes stand out in my mind. I do not even like radishes. And we grew a lot of indoor plants also. And learned the proper way to prune trees and other things. But I must say I have forgotten most of it. I think if civilization as we know it collapsed that I cold manage to get by, but I have lost of expertise. And every plant I get now dies. Some of them die within a few hours of entering my home. I love succulents and have been eyeing all the cute little container gardens and succulents on the web. But I just know better than to try. So THIS is my kind of Terrarium. You don't need to water it. It does not require sunlight. And your cat will not eat it and then spit up on the rug.AND it's 4 x 6" so will fit a standard sized frame. What's not to like? *i am a twin and i find i automatically say "we" instead of "i" when speaking of my childhood. It's not the royal "we", though. I am not putting on airs! little you-i, a photo by megan_n_smith_99 on Flickr. A lot of the time my inspiration for art comes not from images, but from words. Usually a little snippit, sometimes of a song or a poem, sometimes just a little fragment from a book or overheard conversation. if you would like to commission a painting based on your favorite poem, let me know! Time for Tea, a photo by megan_n_smith_99 on Flickr. It's time for another give-away! Comment on this post for a chance to win this painting. On Friday (sept 14) I will pick a winner! Yesterday my friend Peter asked me if I wanted to go to Deception Pass with him and my godkids while his wife Karen was taking a class. Although I suspected my charming company was not the ONLY reason he asked me, I was willing to help with the kid-herding. Lucky for me I was on 5-year-old duty, which is much easier than what he was on: 2.5-year-old duty. I actually got to do a little beach combing while not dragging the 5-year old out of the surf and making sure she did not wander too far away. And collecting her abandoned belongings along her trail, and attempting to keep her from removing all of her clothing. Well, at least until we got back to the car... And I must say, like a cat, she only hears her name when she wants to. Anyway I'd like to say no one fell in, but Finn actually did trip and part of him fell in, at least I can say no one was submerged. I guess that counts as a success. And I found some good rocks. Deception Pass was named by George Vancouver, one of the first Europeans to explore the area. He actually thought that Whidbey Island was a peninsula until he found the narrow pass - so he considered himself deceived. Vancouver described the pass thusly: "A very narrow and intricate channel, which, for a considerable distance, was not forty yards in width, and abounded with rocks above and beneath the surface of the water. These impediments, in addition to the great rapidity and irregularity of the tide, rendered the passage navigable only for boats or vessels of very small burthen." 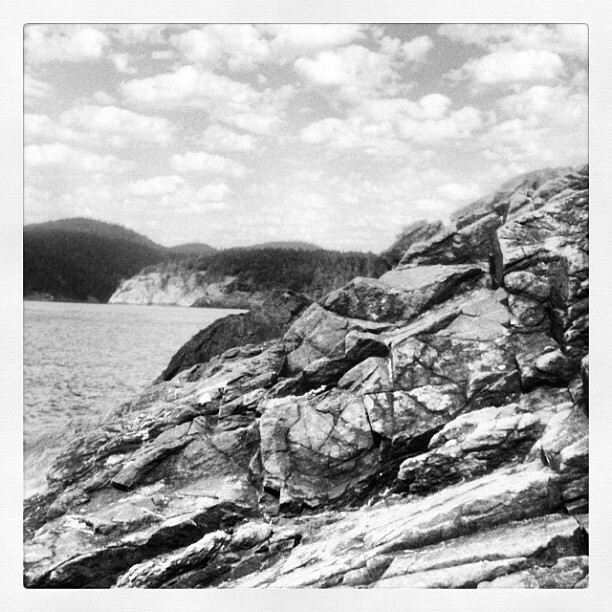 The pass runs between Whidbey and Fidalgo Islands. Apparently one of the small islands in the area was used by smugglers in the 1880s. Then in the early 1900s there was a quarry in the area where convicted prisoners (including murderers of course) quarried rock under armed guard. Also the pass is known for its swift currents and small boats are advised to only approach it with caution - if at all. I've gone Kayaking near there and can confirm the warnings are all true! After yesterday, I was glad to have a quiet day of painting, untangling yarn, and knitting. The temperature is about 20 degrees cooler than yesterday, rain is on the way, and I've made some cocoa. Tree of Life, The Golden Bough, Balder, and Mistletoe. Tree of Life, a photo by megan_n_smith_99 on Flickr. I did not feel very well this week and have not been especially chatty, I guess. But at least I did some painting and knitting. I love painting trees and feel especially inspired to do some in autumn - though this tree has not started to change colors yet. There are 2 things to look for: an owl and the golden bough. Mistletoe is a parasitic plant - it actually grows in the boughs of other plants- and it can be gold in color, so I suppose that is where I got THAT idea. Or maybe Frazer even mentions that connection someplace in The Golden Bough. I think that is just about enough thinking and research for a Saturday..
strata, a photo by megan_n_smith_99 on Flickr. 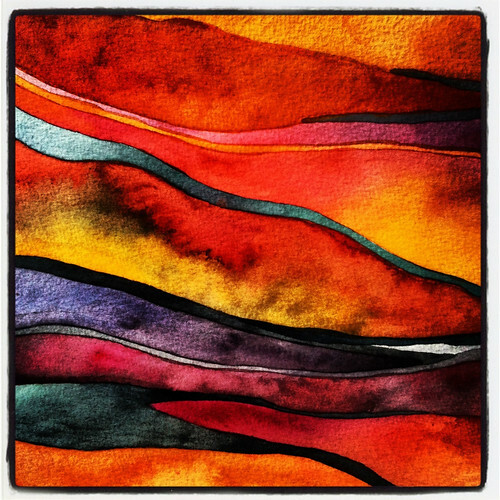 This is a detail of a recent painting, manipulated with Instagram. Pantone has released their Fall color trends and I see their color of the year, "Tangerine Tango" is still "in" for fall. 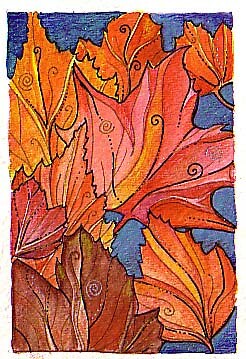 I must say most of the colors they've predicted don't seem very fall-like to me. I do seem to have hit on a few with this painting - I've at least gotten close to Tangerine Tango and Honey Gold. I had a headache all day yesterday and am a bit behind on things like email and .. oh, life. So I think I will keep this post short and sweet. "I saw old Autumn in the misty morn stand shadowless like silence, listening to silence." All-Seeing Fungi, a photo by megan_n_smith_99 on Flickr. Can you find the owl hiding in this drawing? He requested to be be featured but he did not want to take front and center stage. Dia de los Muertos, a photo by megan_n_smith_99 on Flickr. Do you know how you wake up some mornings filled with energy and enthusiasm for life? Yeah, me neither. I think it might be a quiet day on the couch. I did get some chores done yesterday before fatigue and pain set in. I just finished reading the first book in the 100 Cupboards series by by N.D. Wilson and really enjoyed it. I am glad there are 2 more waiting on my Kindle. I love getting e-library books, especially since the library is closed for budget cuts this week. amazon says this series is for ages 8-and-up so i am clearly part of their target audience. "Twelve-year-old Henry York wakes up one night to find bits of plaster in his hair. Two knobs have broken through the wall above his bed and one of them is slowly turning . . .Henry scrapes the plaster off the wall and discovers cupboards of all different sizes and shapes. Through one he can hear the sound of falling rain. Through another he sees a glowing room–with a man pacing back and forth! Henry soon understands that these are not just cupboards, but portals to other worlds." Oh my, I am one of those people who spent their childhood hoping that I would stumble into a wardrobe and out into Lantern Waste. As an adult I guess I am still hoping that I'll figure out the right pattern to tap the bricks and end up in Diagon Alley. Stranger things have happened. Almost every advance in particle physics, is stranger than Harry Potter's World. So it seems .. well, almost possible. We'll see. Available on Etsy. I've got a couple more Halloweeny things as well. This space is always subject to change because things seem to pop up. More details will be added as events approach. email me (mnoel@rdwarf.com) and we can arrange to meet so you can see my work in person. I don't usually invite guests to my studio since it is TINY and i also live there! But we can meet for coffee or tea and I will bring my portfolio. 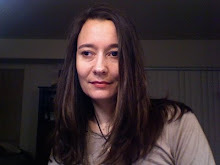 Megan Noel is a textile and mixed media artist creating in the Northwest. Megan gets her inspiration from nature, vintage beadwork, mythology, and literature. Her inspiration is fickle, and more likely to be the result of a line from an ee cummings poem than an article in a bead or art magazine. Megan also plays the violin. This is a Flickr badge showing photos in a set called new watercolor. Make your own badge here.